Thermal imaging system and night vision scopes are similar hunting tool where both use completely different technology. Night vision scope amplifies the light and thermal scope detects the temperature change. This is the basic difference between this two types of hunting tool. However, they have some unique feature, advantages, and disadvantages as well. Knowing the major differences, features, and advantages will help you finding the right type of tool for you. This will increase the efficiency of your hunting and save your time. I will list some major difference between these tools to assist you regarding the issue. If you choose the wrong type of product, then you won’t able to use that tool and the result cause many negative issues. Thus I suggest you compare both types of product features and pick the perfect one for you. Before you choose the right type of tool, you need to know the basic differences that will enrich your knowledge. Because choosing the wrong type of product hamper on your work and waste the money as well. Additionally, there was a price difference between these types of products that can make you ultimate loose. Both types of tool come up with separate technology that makes them unique. Night vision scopes just amplify the visible lights and help you seeing those glimpse of light. If there is complete darkness, you will watch nothing. Because night vision scopes only amplify the lights. It can’t connect the other energies like heat or sound. The technology uses only the power of light and magnifies those lights to make it more visible to you. So you are dependent on light to use your night vision scope. On the other hand, Thermal imaging uses multiple energies like heat and radiations and display them as a change of color. Different temperature and radiations are marked as a different color that allows you getting a clear concept about the object. Image refresh rate provides a clear concept about the object. You can easily identify any living object as they move continuously. This technology is more advanced now and helps you identify the radiation dispersed from the object. So the technology used on these tools are completely different from each other. Depending on the environment, you have to pick the perfect tool for you. You can’t use the thermal scope from a position that does not pass any temperature. If you are in a shelter that is protected with glass for a cold environment, then you can’t use the thermal scope. But the night vision scope can work properly, even the temperature do not pass through the glass. But the night vision scope will not work in the dark night. So you have to pick the perfect equipment depending on your necessity. This will allow you getting the best service from your hunting tool. You should know the purpose and good knowledge about the environment are required as well. This will help you choose the proper tool without any hesitation. This will increase the ease of use of these amazing hunting tools and remove the confusion as well. If you are moving constantly and you need to cover a range of area, then night vision is the best tool that will help you. You can set it on your head and more conveniently. This will help you cover an area without any issue. People use night vision scope for tactical purpose. You need to check the features carefully and find the perfect one that allows you using the tool in tactical purpose. On the other hand, using a thermal scope does not allow massive movement. You need to set it in a certain position and use it. You can control it using the remote control as well. So in term of tactical use, night vision allows more comfort. You can use night vision camera and thermal scope for home defense purpose. Night vision scope allows a clear view of home and helps for gathering all the members safely. But it does not provide a clear view when everything is dark. That means you can’t use it in dark and critical situation. On the other hand, the thermal scope helps to observe the temperature change of your home or other workplaces. This will help you record the video as well. Later you can analyze the footage and most of the thermal scope have strong battery power that ensures long time use. Few thermal scopes have an external power supply system that you can use for a long time without any issue. You can connect Wi-Fi to enable some advanced feature and make it more impactful. 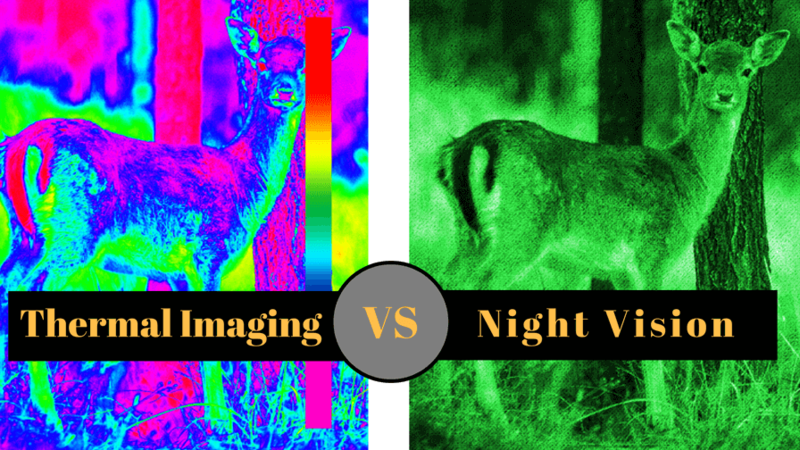 Night vision scopes offer more depth for watching animals in the evening time. You can use your night vision scope that comes out in the evening and night time as well. But you need to ensure the environment is not completely dark. This type of scope covers a certain area to see animals. You need to use it in a convenient environment. The thermal scope has a different purpose that you can use to find hidden animals when it’s on the opposite side of a tree or something. Because thermal scope uses a technology that uses temperature change and radiation change as well. So you can easily identify them effectively. Both types of the product have price variation. You have to identify the perfect type of product depending on your need. Product price makes a huge difference between these types of products. Depending on other features, you need to choose the perfect product. Thermal scope and night vision scope has similar functionality, but they use different technology. This makes a difference between these two types of product and people use for specific purposes. You have to set your target before you pick the right type of product for you. But in general we can declare, night vision scope as light duty scope and thermal scope as heavy duty scope.